- Vol. 1, no. 1 (Apr. 11, 1942)-v. 16, no. 7 (Oct. 19, 1945). - Published Apr. 11-May 31, 1942 at the Manzanar Assembly Center; June 1, 1942-Sept. 8, 1945 at the Manzanar Relocation Center. - Supplements accompany some issues. - Available on microfilm from the Library of Congress, Photoduplication Service; also available online. - "Official publication of the Manzanar Relocation Center Administration and newspaper of Manzanar Community Enterprises." Manzanar Free Press . Manzanar, Calif., April 3. (Manzanar, CA), Apr. 3 1943. https://0-www.loc.gov.oasys.lib.oxy.edu/item/sn84025948/1943-04-03/ed-1/. 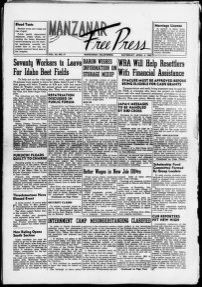 (1943, April 3) Manzanar Free Press . Manzanar, Calif., April 3. Retrieved from the Library of Congress, https://0-www.loc.gov.oasys.lib.oxy.edu/item/sn84025948/1943-04-03/ed-1/. Manzanar Free Press . Manzanar, Calif., April 3. (Manzanar, CA) 3 Apr. 1943. Retrieved from the Library of Congress, www.loc.gov/item/sn84025948/1943-04-03/ed-1/. Japanese relocation, California. Ester Naite, an office worker from Los Angeles, is shown operating an electric ... 1 negative : safety ; 5 x 7 inches or smaller. Japanese relocation, California. A view of the quarters at Manzanar, California, a War Relocation Authority Center ... 1 negative : safety ; 5 x 7 inches or smaller. ジャパニーズ・アメリカ : 移民文学・出版文化・収容所 / Includes bibliographical references (pages 344-363) and indexes. 文献:p344-363 北米日系移民文学・文化史関連年表:p369-378.